NEW YORk, NY. - Sotheby’s 4 November 2009 Evening Sale of Impressionist and Modern Art in New York will feature seven paintings from the Durand-Ruel Collection, encompassing works by a number of the Impressionist masters that legendary art dealer Paul Durand-Ruel represented -- Pierre-Auguste Renoir, Camille Pissarro and Alfred Sisley. All but one work were acquired by Paul Durand-Ruel directly from the artist and all have remained in the family ever since. Many have not been exhibited since the 1950s and together the offering is estimated to bring $8.9/12.6 million (£5.4/7.7 million, €6.3/8.9 million). Early this fall, highlights will be exhibited in Paris, Hong Kong and London. Paul Durand-Ruel’s (1831-1922) impact on the history of art and the art market cannot be understated. He revolutionized the relationship between artist and dealer and was responsible for bringing French Impressionism to the world through his galleries in London, New York and Paris. His bold decision to exhibit the Impressionists in New York in 1886 introduced enlightened American wealth to modern French painting. 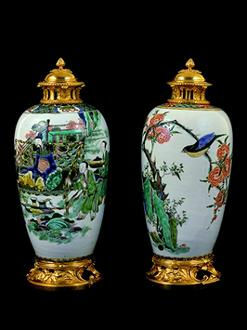 His dossier of American clients included distinguished names such as Havemeyer, Philips, Potter-Palmer and Pope. It was their generosity, together with Durand-Ruel’s vision, that helped to fill great American museum collections with Impressionist masterworks. Included in the November offering are three works by Pierre-Auguste Renoir. 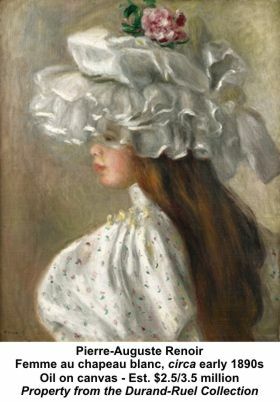 Femme au chapeau blanc belongs to a series of oils that Renoir completed in the early 1890s of young women wearing elaborately decorated chapeaux (est. $2.5/3.5 million, £1.5/2 million, €1.8/2.5 million). During the 1890s, Renoir’s life was divided into two distinct parts, both reflected in his work. On one side were his elite clientele whom he depended upon for portrait commissions and on the other were the lesser-known models, most often young girls, whose youth and beauty enraptured Renoir. While painting formal society portraits sustained the artist’s way of life, his studies of unidentified young women allowed him greater freedom of execution. The present picture is an example of Renoir’s bravura - his rapid feathery brushstrokes lavish attention upon the crisp fabric of the model’s dress, the pleating over her shoulder and the airy crinoline of her hat. Also by Renoir is Baigneuse, which offers a superb example of his later style, exemplifying his ability to capture the female form with his fluid, loose brushwork (est. $700,000/1 million, £400/600,000, €500/700,000). His masterly painting technique builds up a shimmering paint surface that gives his late nudes their distinctive quality; a style that allowed him to showcase an astonishing mastery of a broad range of painterly effects. It was these late monumental nudes that for many comprised Renoir’s greatest artistic achievement and provided an important source of inspiration for Cézanne and Picasso’s neo-classical nudes. Renoir’s still-lives, including Nature Morte aux Pommes et Poires, are some of the most sensually appealing compositions in art history (est. $350/450,000, £200/300,000, €250/350,000). Rendered with the artist’s characteristically soft palette, these compositions capture the aromatic beauty of each succulent piece of fruit. These deceptively simple still-lives, which proved to be wildly popular among clients of Paul Durand-Ruel, revitalized this age-old subject with an Impressionist flair. 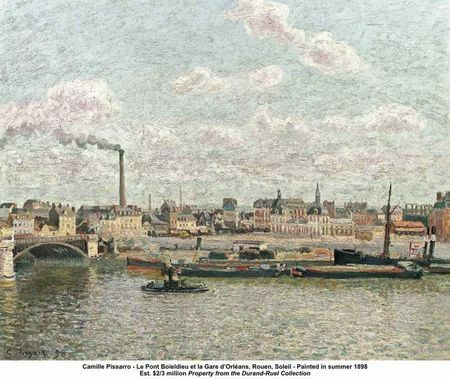 Camille Pissarro’s sweeping view of Rouen in Le Pont Boieldieu et la Gare d’Orléans, Rouen, Soleil presents one of France’s most modern cityscapes at the threshold of the twentieth century (est. 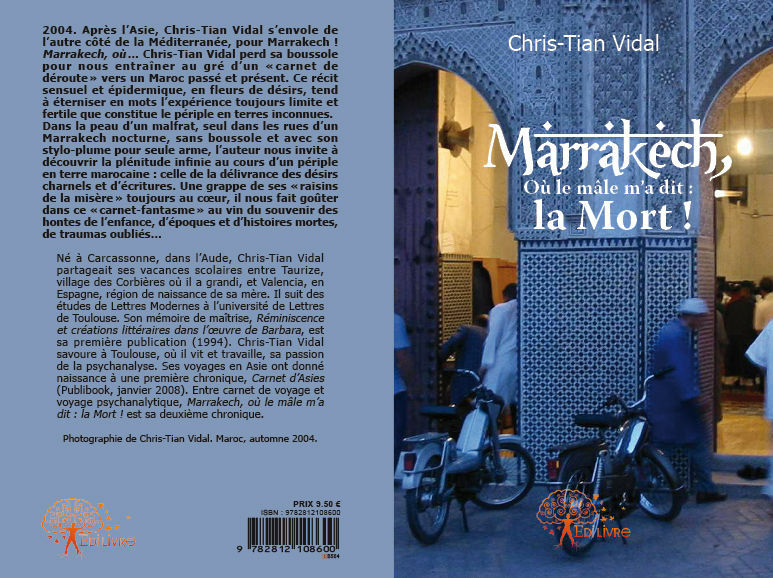 $2/3 million, £1.2/1.8 million, €1.5/2 million). Pissarro painted this urban landscape in the summer of 1898, four years after Monet completed his famous series of the façade of the Rouen’s gothic cathedral. 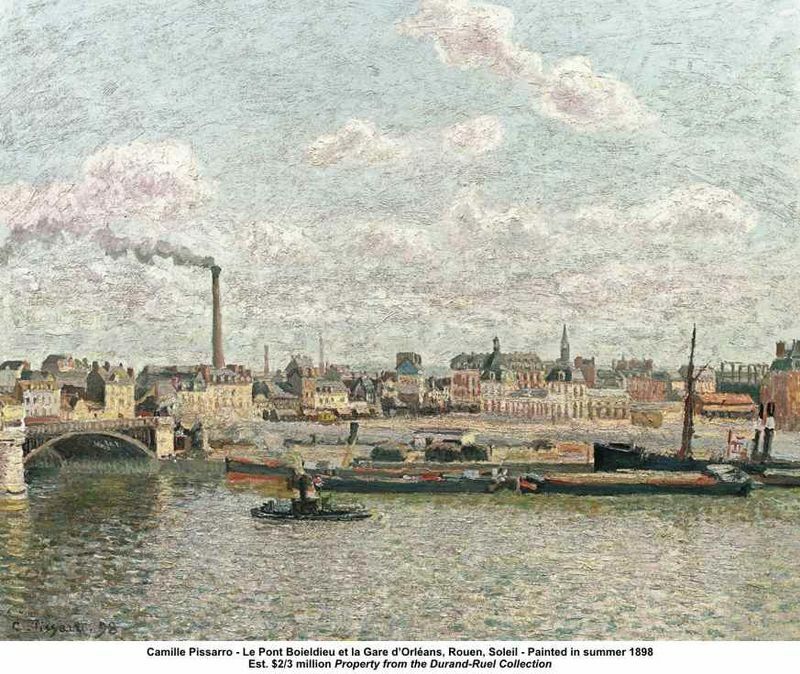 This was Pissarro’s fourth trip to the city, and during his three month stay he painted twenty views. The present view, illuminated with the brilliance of sunlight, captures the urban energy that Pissarro must have found so intriguing. Also by Pissarro is Jardin du Louvre, Effet de Neige; painted by the artist during the winter of 1899 when he rented an apartment in Paris and executed a series of views of the Jardin des Tuileries (est. $1,250,000/1,850,000, £700,000/1 million, €800,000/1.2 million). Having completed a series depicting the Boulevard Montmartre, with its wide thoroughfare pulsating with horse-drawn carriages, pedestrians and other signs of the busy life of the metropolis, Pissarro took pleasure in painting the calmer, greener parts of Paris and in depicting nature within the city. With its fascinating architecture and history, the Jardin des Tuileries captured the imagination of the other Impressionist artists, including Claude Monet who, in 1876, depicted a view from an apartment only a few doors away from the one Pissarro occupied, at 198 rue de Rivoli. La Seine à Argenteuil with its tranquil ambiance and focus on the rural, pre industrial aspects of river life is typical of Alfred Sisley’s finest work (est. $1.5/2 million, £900,000/1.2 million, €1/1.5 million). 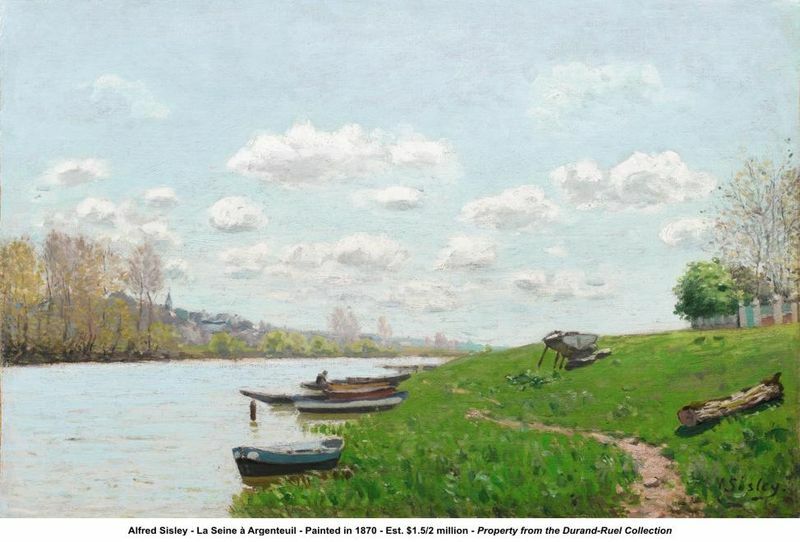 Painted in 1870 during a stay in Argenteuil with Monet shortly after the Franco-Prussian War, the present canvas belongs to a group of works that documents Sisley’s observations of the town and its riverbanks. While sharing a general affinity with Monet’s work of this period, Sisley’s own particular fixations are evident in the subject matter of these paintings – his compositions place a greater emphasis on the serenity of nature and the subtle harmonies of light and color, unlike those of Monet who often chose to highlight riverside activity or industry as symbols of modernity. The commune of Sèvres, located just over six miles southwest of central Paris, was the setting of several of Sisley’s landscapes at the height of his involvement with the Impressionist group. The artist moved to Sèvres in 1877 and spent the next three years painting its landmarks, including its bridges, the station house and the well-known porcelain factory. Vue de Sèvres provides a vivid depiction of the landscape’s topography, particularly in its rendering of the steep roadway that trails off into the background (est. $600/800,000, £350/450,000, €450/550,000). From the verdant green that dominates the composition, it seems likely that Sisley painted this oil in late spring or early summer of 1879. By the end of the year Sisley would turn his artistic attention towards views of Moret-sur-Loing, but his experience in Sèvres was fundamental in shaping his technique for those later landscapes.